Our Expectations: The Bacon Royale. A mouth-watering combination of beef, pork and dairy. 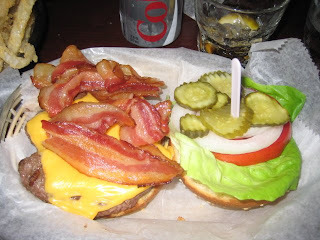 With bacon, lettuce, tomato and onion, it's as American as one can get. Our personal favorite type of burger to consume, bacon cheeseburgers make their way to our hearts, either in the form of cholesterol or love, but who's keeping track? Such things are inconsequential in our burger blogging lives. We just know the patty comes from 75 pecent Black Angus, it's bun from Tom Cat Bakery and the cheese is Boar's Head. Meat: To date, chalk this one up as the champ, 'cause this beef delivered a powerful punch. Obviously, we got back up to finish off our burgers, but the first bite landed a strong blow. Fresh as can be, perfectly seasoned, and tenderly delicious. The patty, consisting of 75 perfect Black Angus, combined superb taste with a perfectly broiled and glazed outer coating. Even better, it was cooked to temperature just as we specified. A medium rare burger like the one at Royale is exactly what we expect from all of the best burger establishments in NYC. Toppings: Lets give the bacon a B+, not the best we've had, but its well ahead of the curve. The cheese, well that left something to be desired. We both chose American, our favorite on a cheeseburger, but maybe Cheddar would've been a wiser choice. Blue cheese is also an option, but keep in mind that can overpower the patty. As burger traditionalists we couldn't succumb to that option. Swiss is available too, but we moved right past it. Maybe we're being finicky, but our cheese came off in globs and wasn't smothered delicately over the patty. Remember Mom's grilled cheeses? Sometimes you need those reminiscent characteristics on a burger, expertly organized and well thought out...obviously hold the tomato soup. The rest, fresh lettuce, tomato and onion. Even a few pickles thrown in there which always add a zesty crunch, if you dare. Bun: Utter disappointment...plain and simple. Royale captured our hearts up to this point, but the dry, tough texture of the sesame seed bun really did this burger wrong. Though they're skillfully created by Tom Cat Bakery, which is a wondrous place, the bun came hard as a rock and lacking substantially fluffiness. It just may have been old and stale, or perhaps we caught Royale on an off day. Regardless, bearing full disclosure, this was the first burger joint where we decided to remove the top portion of the bun halfway through eating in order to enjoy the goodness of the beef and toppings. Meat (48): A true knockout. Killer taste, tenderness and temperature. To date, our favorite beef of the bunch we've reviewed. Toppings (21): Above average. Success on the bacon, slight reduction for the cheese, but no flair after that. 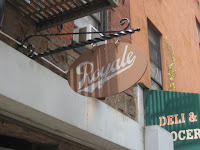 Definite room for improvement..
Bun (17): If the owner's of Royale are reading this, we loved your burger, but please (!!!) change that bun. 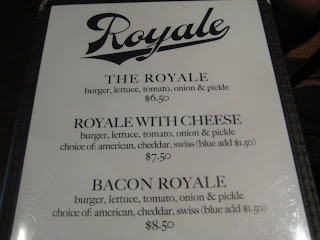 A potato bun would do wonders for the Bacon Royale. Possibly vaulting it higher up on our rankings. Still, we saw the idea behind the bun, from a strong bakery. Perhaps we just caught you at your worst. Vincent: Know what they call a Quarter Pounder with Cheese in Paris? Vincent: Naw, man, they got the metric system, they wouldn't know what the f**k a Quarter Pounder is. Jules: What do they call it? Vincent: They call it a "Royale with Cheese". Jules: What do they call a Big Mac? Vincent: A Big Mac's a Big Mac, but they call it "Le Big Mac". Jules: [in mock French accent] "Le Big Mac." [laughs] What do they call a Whopper? Vincent: I don't know, I didn't go in a Burger King. Amongst the many questions we at Burger Bedlam get asked on a daily basis is: Does price matter when naming the best NYC burger? In short, yes. Who wants to dole out their hard earned cash for something that could barely satisfy your average burger lover? I mean, c’mon brother, you ever hear of a recession?!? Yet, sating our taste buds with the finer things in life can often require a bit more coin. 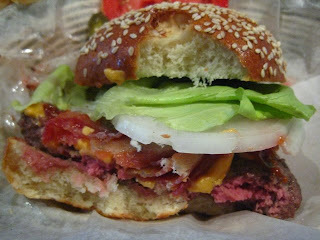 Yeah, we consider beef a “finer thing” once in a while…we’re burger bloggers! Still, we’d like to exit a burger establishment with our shirt, so we often take offense to a burger priced north of $15. We do, however, take into account the quality of ingredients, location of the restaurant/bar/pub and clientele.